Classic rosette-shaped cataract in a 36-year-old man, 4 weeks after blunt ocular injury. Same cataract as seen in previous image, viewed by retroillumination. Penetrating trauma that directly compromises the lens capsule leads to cortical opacification at the site of injury. If the rent is sufficiently large, the entire lens rapidly opacifies, but when small, cortical cataract can seal itself off and remain localized. Approximately 2.5 million eye injuries occur annually in the United States. It is estimated that approximately 4-5% of a comprehensive ophthalmologist's patients are seen secondary to ocular injury. Traumatic cataract may present as acute, subacute, or late sequela of ocular trauma. The male-to-female ratio in cases of ocular trauma is 4:1. Work- and sports-related eye injuries most commonly occur in children and young adults. Between 1985-1991, a National Eye Trauma System study reported a median age of 28 years in 648 assault-related cases. The prognosis is dependent on the extent of the injury. Protective eyewear is important in high-risk activities to avoid injury. For patient education resources, see the Eye & Vision Center as well as Cataracts. Tasman W, Jaeger EA. 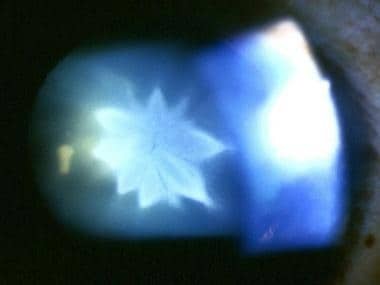 Traumatic cataract. Duane's Clinical Ophthalmology. 1997. 1: 13-4. Shah MA, Shah SM, Gosai SR, Gupta SS, Khanna RR, Patel KB, et al. Comparative study of visual outcome between open- and closed-globe injuries following surgical treatment of traumatic cataract in children. Eur J Ophthalmol. 2018 Jul. 28 (4):406-411. [Medline]. Dinakaran S, Kayarkar VV. Traumatic retinal break from a viscoelastic cannula during cataract surgery. Arch Ophthalmol. 2004 Jun. 122(6):936. [Medline]. Jaffe NS, Jaffe MS, Jaffe GF. Lens displacement. Cataract Surgery and Its Complications. 1997. 200-11. Sarikkola AU, Sen HN, Uusitalo RJ, Laatikainen L. Traumatic cataract and other adverse events with the implantable contact lens. J Cataract Refract Surg. 2005 Mar. 31(3):511-24. [Medline]. Kanski JJ. Clinical Ophthalmology: A Systematic Approach. 1989. 257-8. Shah MA, Shah SM, Shah SB, Patel CG, Patel UA. Morphology of traumatic cataract: does it play a role in final visual outcome?. BMJ Open. 2011 Jan 1. 1(1):e000060. [Medline]. [Full Text]. Schwab IR, et al. Anterior segment trauma. AAO Basic and Clinical Science Course. Section 8. 1997. 285-6. Witherspoon CD, Kunh F, Morris R, et al. Anterior and posterior segment trauma. 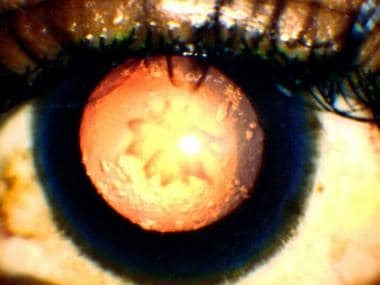 Master Techniques in Ophthalmic Surgery. 1995. 538-47. Tabatabaei A, Kiarudi MY, Ghassemi F, Moghimi S, Mansouri M, Mirshahi A, et al. Evaluation of posterior lens capsule by 20-MHz ultrasound probe in traumatic cataract. Am J Ophthalmol. 2012 Jan. 153(1):51-4. [Medline]. Kumar A, Kumar V, Dapling RB. Traumatic cataract and intralenticular foreign body. Clin Experiment Ophthalmol. 2005 Dec. 33(6):660-1. [Medline]. Rofagha S, Day S, Winn BJ, Ou JI, Bhisitkul RB, Chiu CS. Spontaneous resolution of a traumatic cataract caused by an intralenticular foreign body. J Cataract Refract Surg. 2008 Jun. 34(6):1033-5. [Medline]. Tabatabaei A, Hasanlou N, Kheirkhah A, Mansouri M, Faghihi H, Jafari H, et al. Accuracy of 3 imaging modalities for evaluation of the posterior lens capsule in traumatic cataract. J Cataract Refract Surg. 2014 Jul. 40 (7):1092-6. [Medline]. Shah MA, Shah SM, Patel KD, Shah AH, Pandya JS. Maximizing the visual outcome in traumatic cataract cases: The value of a primary posterior capsulotomy and anterior vitrectomy. Indian J Ophthalmol. 2014 Nov. 62 (11):1077-1081. [Medline]. Trivedi RH, Wilson ME. Posterior capsule opacification in pediatric eyes with and without traumatic cataract. J Cataract Refract Surg. 2015 Jul. 41 (7):1461-4. [Medline]. Chuang LH, Lai CC. Secondary intraocular lens implantation of traumatic cataract in open-globe injury. Can J Ophthalmol. 2005 Aug. 40(4):454-9. [Medline]. Phillips PM, Shamie N, Chen ES, Terry MA. Transscleral sulcus fixation of a small-diameter iris-diaphragm intraocular lens in combined penetrating keratoplasty and cataract extraction for correction of traumatic cataract, aniridia, and corneal scarring. J Cataract Refract Surg. 2008 Dec. 34(12):2170-3. [Medline]. Kumar S, Panda A, Badhu BP, Das H. Safety of primary intraocular lens insertion in unilateral childhood traumatic cataract. JNMA J Nepal Med Assoc. 2008 Oct-Dec. 47(172):179-85. [Medline]. Shingleton BJ, Hersh PS, Kenyon KR, et al. Lens injuries. Eye Trauma. 1991. 126-34.